There are several elements that contribute to the choices we make when deciding which watercolour we will choose for our paintings. 4 which factory it came from. This blog is about that fourth option: the manufacturer. There are major paper manufacturers in every country. As well as smaller mills and handmade options to choose from as well. Lismore is 2.5 hours south of Brisbane, 1 hour from Byron Bay and 10 hours from Sydney. It may look like we are in the middle of nowhere, but in fact, we are in the centre of the universe. I’m writing this in Australia, from a small, regional, university town lucky enough to have 2.5 art supply shops. Through them we have access to the main papers on the market. And the word here is “market”. I am only guessing that these are the main types of paper – it could be that they are just the ones I’ve heard of, or the only ones that get into Australia. I’ve heard stories from my American friends about how tricky it is to buy warm white paper -the market there, it seems, requires high white. Indian artists on Facebook speak of how expensive Arches is. This is a story about paper in my art shops, in my country. So this isn’t a complete comparison. It’s just a comparison between two papers, similar in every way except from the factories they were made in. I know that I’m missing other well-known similar papers, such as Arches or Artworx Cotton Sensations, but this isn’t a story about those, not today. If anything it’s a story about how to test your paper. What sort of things I do when I need to compare. One of my suppliers in Lismore, Premier Art and Framing, often showed me other papers when I went in for my Saunders Waterford. Good marketing on their part, happy to know what’s there. The test sheets, at the end of this page, came at a time when I was questioning a lot of things that I’d taken for granted in my life. Like tea – what would happen if I had chai instead; exercise – would swimming at the beginning of another hot summer’s day be enough of a workout; paper – is the paper I’ve been using for more than 20 years still the best paper? My advice is to know your materials. 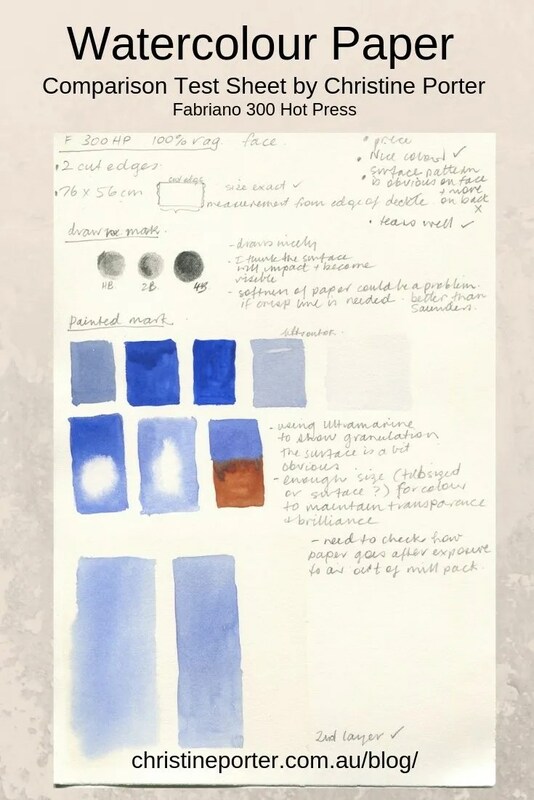 Know what your paints, paper and tools can do – their parameters, their faults, their finer points. Find time to explore the comparisons as logically as suits you. Some of us are quite scientific and like to make charts and take notes. I do find that considered experimentation helps, and discussion too, but then I live a language based life. Others of my friends, equally successful and knowledgable, acquire the information randomly and still make informed decisions that suit them and their practice. That’s the clue. What suits one person may not suit another. What might suit in the sort of wet, humid summers we get here on the coast may not suit in the dry outback where I used to live. What may suit today, may not tomorrow. 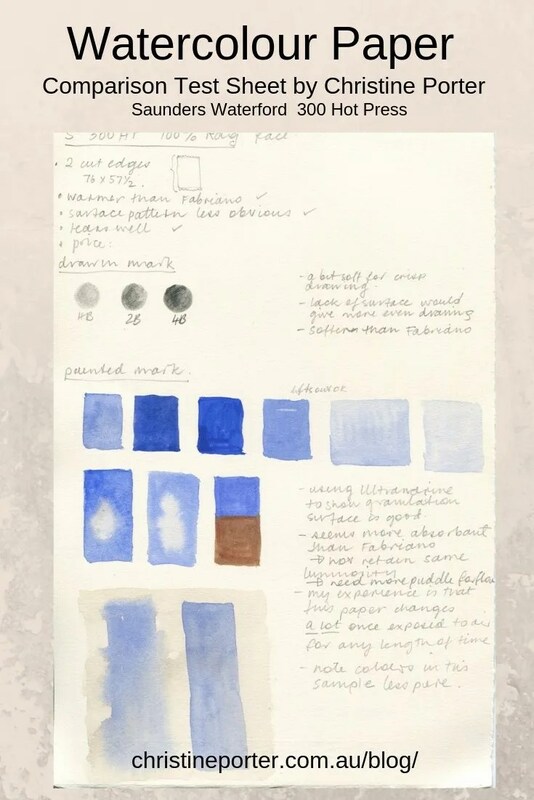 I tested using dry and wet applications of paint – using artist quality Ultramarine to check for the impact of granulation. I tested how a fine pencil mark happens. I recorded which edge had the deckle (yes, this makes a difference if all your mats are suited to the smaller vertical for example). I did both comparisons on the same day, on paper fresh out of a pack. In other words, I removed as many variables as I could. Three watercolour papers, all 100% rag: Bockingford, Saunders Waterford, Millford. Factory also produces a printmaking paper (Somerset) and digital fine art printing papers. Since 1700’s. This has been my choice of paper for a number of years. There have been changes in that time, the normal seasonal changes that would be inevitable over 30 years, as well as changes in the number of deckle edges available, and the surface. Many watercolour papers, only three 100% rag: Esportasione, Artistico and Artistico Extra white. Factory also produces 50% and 20% rag papers, as well as many printmaking, pastel and drawing papers (and paper used for banknotes!) Since 1264. Papers from this manufacturer are readily available in Australia. Sometimes they are less expensive. Having the 20% cotton option makes for sensible choices. Yes, this paper, Saunders Waterford, made in this factory on the other side of the world, continues to suit me. And I’ll continue to use it. It’s different from the Fabriano, but not in a bad way – just in a different way. There’s only so much science that an artist needs. In the end it’s about personal preference. But I will also continue to check. I’ll check as I go along. I’ll experiment with other papers, the difference for example between the S300HP and the S425HP is astonishing. Or I’ll buy the occasional sheet of other paper if it crosses my path and try it out. It’s best to have a few papers you’re happy with. Papers change, that’s the nature of the world. Paper can change over years, between mill packs or if a pack has been open on the shelf too long. It’s one of the challenges of watercolour, but one of the joys too. And really, would we have it any other way? Posted in PaintingTagged Fabriano, paper, Saunders, watercolour.